"Always remember, dear, my love shall never forsake thee...as long as water runs." When The Jazz Singer set Hollywood on its head in 1927, the studios rushed to make whatever they could into a sound feature. During a transition period of several years, many motion pictures had a soundtrack with music (often supplied on phonograph discs that accompanied the film), but no dialogue to speak of, that still being handled with traditional intertitles. Such a feature is Evangeline (1929). The Acadian French villagers of Grand Pre in 1740s Nova Scotia are living a happy and peaceful life. The beautiful Evangeline Bellefontaine (Dolores Del Rio) is engaged to Gabriel Lajeunesse (Roland Drew) and their future looks bright. However, a proclamation from the English governor general quickly changes all that: the men of Grand Pre are required to support England in the coming war against the French, their own relations. When a group of citizens goes to the governor general to petition him for relief, the response is the deportation of all of these unloyal Acadian subjects, and seizure of their lands and goods. In the chaos, Evangeline's father (Paul McAllister) suffers a stroke and dies, and while tending to him, she is separated from Gabriel. Evangeline, accompanied by the village priest (Alec B. Francis) then begins a search across the North American continent to be reunited with her lover. Since it is not really a sound film yet, Evangeline is not as stage- and microphone-bound as most of the early talkies of this period. There are attractive visuals with sweeping camera movements, reflecting the art of the silent cinema at its height. The story and its presentation are highly moving, from the deportation to the seemingly impossible search. One striking sequence features Gabriel on one side of an island paddling away from the camera while Evangeline simultaneously paddles toward the camera on the other side of the island. Unabashedly romantic, the film admirably succeeds as a tearjerker. Del Rio is quite beautiful in this part (although she really looks a shade too Hispanic to be a convincing Acadian), and gives a highly passionate performance. Roland Drew as her lead doesn't get enough screen time to really stand out, but Donald Reed as Baptiste, another suitor for Evangeline's hand, makes the most of his small part. Interestingly, McAllister is made up to strongly resemble Longfellow, upon whose poem this film is based. Highly affecting, and often breathtaking in its scope and location cinematography, Evangeline is a worthwhile film for anyone looking for an old-fashioned romance. Image Transfer Review: The picture is generally quite attractive, with delicate tints through much of the film. There is frequent speckling, but no major film damage is visible. Overall the source quality is quite high for a picture of this vintage. The one exception is some nighttime scenes in the last reel, which are so dark as to be completely illegible. The earlier portions of the film have excellent contrast and very good black levels with plenty of detail. In all, a very satisfactory viewing experience. Audio Transfer Review: Most of the audio here comes from the original Vitaphone sound discs. Accordingly, there is crackling heard throughout but the sound quality is surprisingly good. Bass levels are quite marginal, but the higher regsiters are decent. Unfortunately, a few of the early discs have not been found, so a modern recording is interpolated as necessary. This new recording sounds quite good, without hiss or noise, which makes the Vitaphone when it reenters rather noticeable. Del Rio has two songs early on that are thus lost to us, but she does have several surviving vocals in the later portion of the picture, plus a single concluding line of dialogue that I can't understand - considering the context, I assume is French. Extras Review: Chaptering is just barely adequate. Beyond that, rien du tout. 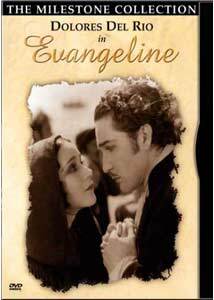 A highly effective romantic tearjerker, Evangeline has a nice (though occasionally too dark) transfer, with decent audio reproduction from the old Vitaphone discs. Definitely worth a look.